Like the introduction of Long John, this was a page I’ve had in my mind––mostly––for a long time, now. Specifically, I had the three wide panels in mind and knew that the small panels would be a montage of the town. With that in mind, it was a rather easy page to draw (I definitely don’t get to say that too often). 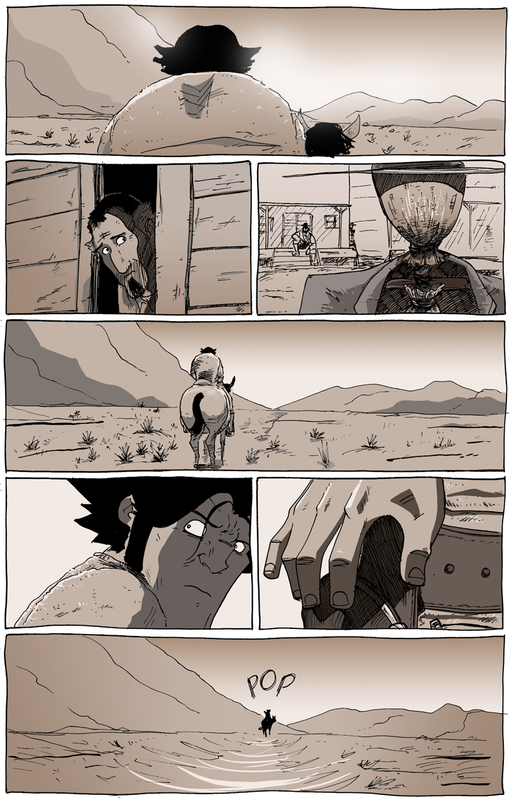 Despite the relative ease of producing this page, I really don’t have a lot to say about it. “Sunza” is wrapping up next week! If you’ve been enjoying Long John, this would be a perfect time to tell other people about it, so they can get on board while the getting’s still good (as they say). Feel free to share the comic on your Facebook, Google+, Twitter, Tumblr sites (as well as any other social media sites that I failed to mention) in order to get the word out there. I’ll be pushing the comic pretty hard for the next few weeks, so be prepared for that. Since it’s finishing up––what was your favorite part of “Sunza”? Who was your favorite character? What surprised you most? What did you think of it, overall? What could have been better? Let me know! I’m eager to hear the feedback of the people who spent the time to either stick with it from the beginning or who have read through the entire archives. Please spread the Long John love and let me know that you like it, too! The boisterous leader of the gang in control of Poverty Flat. His dandy dressing belies his brutish airs.